Posted January 8, 2014 by backupwp & filed under Guest Post. I had a long list of sensible, useful and long-delayed things to do over the winter break. But I ended up just lounging around indoors while the storms raged outside, reading suspense novels for the entire two weeks. What a treat. Here are my three favourite suspense stories from the holidays, all of which I genuinely couldn’t put down and would be delighted to read again in a couple of years’ time , once my poor old brain has forgotten the plot – a true sign of a particularly good read. Shortlisted for the 2011 Man Booker Prize and the CWA Gold Dagger 2011, Snow Drops is billed as ‘totally gripping’ (The Times), ‘disturbing and dazzling’ (The Sunday Telegraph) and ‘electrifying’ (The Independent). This debut novel, told in the first person, is an enthralling thriller about dirty doings in the Moscow underworld. Nick is writing a letter to the woman he’s about to marry. “You’re always saying that I never talk about my time in Moscow,” he says, “or about why I left.” This tight, compelling thriller is his confession, and his attempt to make sense of his relationship with modern Russia. It opens with the discovery of a corpse — a “Snowdrop”, Moscow slang for a frozen body that emerges in the thaw. Apparently drunks and the homeless are often discovered when the long, freezing Moscow winter ends, revealed by the melting snow. When the main character Nick goes to work in Russia as a senior British lawyer, he meets Masha, an enigmatic local who draws him in to a sinister plot to kill and old woman and steal her flat. He knows corruption is rife, he senses something is terribly wrong, and he knows deep down that Masha isn’t what she seems. But his passion for Masha, much of which is based on sheer loneliness and boredom, blinds him to the horrible truth. Why did I enjoy it so much? I like the first person approach, it’s so personal you feel you’re inside Nick’s head. I like the fact that Nick is flawed, a common theme in my favourite crime books. But most of all I love the atmosphere, which is unremittingly threaten, horribly atmospheric and very finely detailed. I guess Russia is a remarkable place. But there’s no way I’d venture there after reading this book. While the country is westernised and sophisticated, it’s also portrayed as totally brutal, often lacking conscience and common humanity. It’s both familiar and completely foreign, which is profoundly unsettling. I actually felt dirty when I’d finished the book. Call me a hippy if you like but my spirit was soiled by the greyness, the ugliness, the cold, the danger, the boredom, the perpetual sense of impending doom, the snow: yellow, grey, black, slushy or solid. Nasty stuff. A.D. Miller was born in London in 1974. He studied literature at Cambridge and Princeton, where he began his journalistic career writing travel pieces about America. Returning to London, he worked as a television producer before joining The Economist to write about British politics and culture. In 2004 he became The Economist’s correspondent in Moscow, travelling widely across Russia and the former Soviet Union. Come on A D, hurry up and write us another! If you saw him, you died. If you heard his voice, you died. If he touched you, he died. That alone is more than enough to whet the appetite of any self-respecting suspense novel fan. And John Katzenbach’s thriller The Shadowman delivers on its promise. You think you knew what evil is. Until you discover The Shadowman, a Jewish horror who survived the Holocaust by betraying his fellow Jews to the Nazis. Because of him, thousands of innocent people – men, women and children – were slaughtered. He wasn’t alone. But he is one of the few of his despicable kind who survived the post-war Nazi hunts, and now he’s in Miami. He might be an old man but his filthy spirit still roars pure and clear like a flame and he’s totally unrepentant. Holocaust survivors suffer the guilt of living while their families died. But he feels no guilt whatsoever for the deaths he caused. He’s tying up loose ends, murdering the people he didn’t manage to catch during the war. And the retired detective Simon Winter takes on the job of finding and stopping him. John Katzenbach (born 23 June 1950) is a U.S. author of popular fiction. Son of Nicholas Katzenbach, former United States Attorney General, Katzenbach worked as a criminal court reporter for the Miami Herald and Miami News , and a featured writer for the Herald’s Tropic magazine. He is married to Madeleine Blais and they live in western Massachusetts. He left the newspaper industry to write psychological thrillers. His first, 1982’s bestselling In the Heat of the Summer, became the movie The Mean Season, filmed partially in The Herald’s newsroom and starring Kurt Russell and Mariel Hemingway. Two more of his books were made into films in the United States, 1995’s Just Cause and 2002’s Hart’s War. A fourth book, The Wrong Man was recently made (2011) into the French TV film Faux Coupable. If you want to find out more about the author and his work, here’s a link to John Katzenbach’s official website. There’s plenty more where The Shadowman came from, a new book every couple of years or so since 1982, so there’s a rich new seam of thriller books to mine. Result. What about other authors like John Katzenback? Good old Ruth Rendell, British master of the sinister, strange, unsettling and eccentric. This is one of those books I read every five years or so, charmed every time by the freshness, the wonderful lyrical descriptions, the pinpoint-accurate plotting and the slow-release suspense. The Crocodile Bird is a big favourite amongst a massive back catalogue which includes novels by Rendell’s pseudonym Barbara Vine. The author is noted for her elegant prose and sharp insights into the human mind, as well as her cogent plots and characters. Rendell injected the social changes of the last 40 years into her work, bringing awareness to such issues as domestic violence and the change in the status of women. Lady Rendell has received many awards, including the Silver, Gold, and Cartier Diamond Daggers from the Crime Writers’ Association, three Edgars from the Mystery Writers of America, The Arts Council National Book Awards, and The Sunday Times Literary Award. A number of her works have been adapted for film or television. Again the plot is unique, set in a curiously remote are of England where the heroine, Liza, has lived since babyhood, protected from the outside world by her hauntingly beautiful, eccentric murderer of a mother. The novel looks at the way we feel about home and the poignancy of being forced to leave it, growing up through innocence to adult awareness, the caustic nature of powerlessness, the things we do for love and the risks we’re prepared to take to protect what’s ours. All set against a stunningly green, sleepy, silent English landscape, in a context that somehow makes the murders much more shocking and senseless than they would be in an urban setting. What about other authors like Ruth Rendell? Phew. That should keep you off the streets and out of jail for a while. 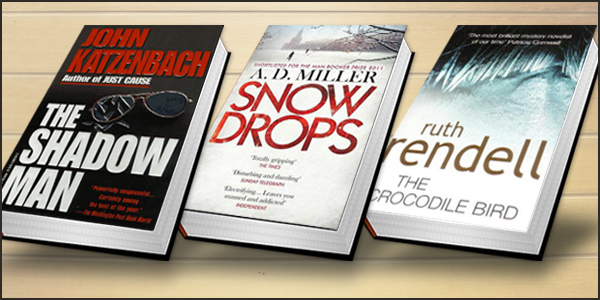 Which is your top recommendation for crime thriller fans? There’s no such thing as having too much to read, so bring ’em on.